To improve national influenza vaccination recommendations, additional data on influenza A and B virus circulation are needed. Here, we describe the circulation of influenza A and B in the Czech Republic during 16 seasons. This was a retrospective analysis of data collected from the 2000–2001 to 2015–2016 influenza seasons by the Czech Republic national influenza surveillance network. Influenza was confirmed and viral isolates subtyped by virological assays followed by antigen detection or by reverse transcriptase-polymerase chain reaction. Of 16,940 samples collected, 5144 (30.4%) were influenza-positive. Influenza A represented 78.6% of positive cases overall and accounted for more than 55.0% of all influenza cases in every season, except for 2005–2006 (6.0%). Both A/H1N1 and A/H3N2 were detected in most seasons, except for 2001–2002 and 2003–2004 (only A/H3N2), and 2007–2008 and 2009–2010 (only A/H1N1). Influenza B represented 21.4% of positive cases overall (range, 0.0–94.0% per season). Both influenza B lineages were detected in three seasons, a single B lineage in 11, and no B strain in two. For the 11 seasons where influenza B accounted for ≥20% of positive cases, the dominant lineage was Yamagata in six and Victoria in four. In the remaining season, the two lineages co-circulated. For two seasons (2005–2006 and 2007–2008), the B lineage in the trivalent influenza vaccine did not match the dominant circulating B lineage. In the Czech Republic, during the 2000–2001 to 2015–2016 influenza seasons, influenza virus circulation varied considerably. Although influenza A accounted for the most cases in almost all seasons, influenza B made a substantial, sometimes dominant, contribution to influenza disease. Consistent with European Union Council recommendations , most European member states have national policies recommending seasonal influenza vaccination for all people at risk of influenza complications. In the Czech Republic, recommendations for seasonal influenza vaccination have been available since 2011 . Reflecting the recommendations of the World Health Organization (WHO), targeted groups include individuals with chronic illnesses and their caregivers, pregnant women, healthcare workers, and adults aged 65 years and older . Despite these recommendations, influenza vaccination coverage in the Czech Republic is substantially below the WHO, European, and Czech targets of 75% for older adults and individuals with chronic illnesses [1, 2, 4]. Although vaccination coverage is not routinely measured in the Czech Republic , recent analyses have reported a vaccination coverage rate of ~ 25% for older adults and persons with underlying comorbidities in the Czech Republic , and moreover, that vaccination coverage could be decreasing . Most influenza vaccines in the Czech Republic are trivalent, containing two strains of influenza A (H1N1 and H3N2) and a single B strain lineage . However, since the early 2000s, two genetically distinct lineages of influenza B virus, Yamagata and Victoria, have co-circulated worldwide, which can result in mismatches between the vaccine and the predominant circulating B strain . Quadrivalent influenza vaccines including both B strain lineages have been developed to prevent these B lineage mismatches [8–11], and have been available in the Czech Republic since the 2017–2018 influenza season. To control influenza spread and encourage seasonal influenza vaccination, national epidemiologic data are needed to help develop policies. Since the 1980s, the Czech Republic has had a relatively stable population of approximately 10.5 million . Surveillance data from the Czech Republic collected between 1999 and 2013 indicated that influenza was responsible for approximately 1408 deaths each year, 1.31% of all-cause mortality, and 1.86% of circulatory disease-related mortality . Limited data are available on the burden of influenza in elderly adults in the Czech Republic , but data have not been published on the burden overall or on the distribution of influenza A and B strains. Here, we describe the results of a retrospective analysis of influenza A and B virus circulation in the Czech Republic from 2000–2001 to 2015–2016. This was a retrospective analysis of data collected by the national influenza surveillance network of the Czech Republic. The primary objective was to describe circulation of influenza A and B viruses during the 16 consecutive seasons from 2000–2001 to 2015–2016. Ethical approval was not required for this study. In the Czech Republic, data on influenza and other ARIs have been collected weekly throughout the year since 1968. The data are collected by more than 2000 general practitioners and more than 1000 pediatricians as part of a sentinel system that covers all 14 regions and approximately 50% of the population in the Czech Republic . Until 2003, data were collected from individuals meeting the WHO case definition of ARI . Starting in 2004, data were also included from individuals meeting the European Centre for Disease Control and Prevention case definition of influenza-like illness (ILI) . Additionally, the Ministry of Health of the Czech Republic manages a surveillance system in which sentinel physicians in each of the 14 regions (usually two physicians per region) collect swabs from their ILI/ARI patients between week 40 of each year and week 20 of the following year. In addition to this sentinel surveillance, since 2009, non-sentinel data and samples have been routinely collected from all hospitalized individuals in the Czech Republic with severe ARI . Data were categorized by age group: 0–5 years (preschoolers), 6–14 years (age range of compulsory education in the Czech Republic), 15–24 years (i.e., until the age when most regular students finish their university study), 25–59 years, and ≥ 60 years (usual retirement age in the Czech Republic). Nasopharyngeal swabs were collected according to the WHO Manual for the Laboratory Diagnosis and Virological Surveillance of Influenza  and were sent to the Czech Republic National Reference Laboratory to confirm influenza virus infection and identify the influenza type or subtype. For samples collected before 2009, influenza infection was confirmed by virological assays and virus was typed/subtyped by antigen detection. Briefly, influenza viruses were proliferated in the allantoic sac of chicken embryos or in Madin-Darby canine kidney cells, and antigens were detected using a Directigen™ EZ Flu A + B kit (Becton-Dickenson, San Jose, CA, USA) or a QuickVue Influenza A + B test (Quidel, San Diego, CA, USA). For samples collected during or after 2009, influenza infection was confirmed and typed/subtyped by reverse transcription-polymerase chain reaction. Briefly, nucleic acids were extracted using MagNAPure LC kits and a MagNAPure Compact instrument (Roche Molecular Systems, Pleasanton, CA, USA) or a RTP DNA/RNA Virus Mini Kit (Stratec Biomedical Systems, Birkenfeld, Germany). For most samples, influenza A and B were detected using the WHO method with primers and probes obtained from the US Centers for Disease Control and Prevention (Atlanta, GA, USA), an AgPath-ID One step RT PCR kit (Thermo Fisher Scientific, Waltham, MA, USA), the MeltMan reverse transcriptase-quantitative polymerase chain reaction system , and SYTO® 82 Orange Fluorescent Nucleic Acid Stain (Thermo Fisher Scientific). In some cases, influenza B and B lineages were detected according to Daum et al. (2007)  using primers and probes described by Schweiger et al. and Watzinger et al. . Hemagglutination inhibition assays may also have been used to detect the B lineage. Data on specific A/H1N1 and A/H3N2 strains and drift variants were not available. Influenza seasons were defined as week 40 of a given year to week 20 of the following year. The peak of influenza activity was defined as the epidemiological week with the highest number of ARI cases during a given season. As described previously , seasons were considered to have significant circulation of influenza A or influenza B when either represented at least 20% of all influenza cases reported. The dominant circulating viruses for each season were defined as the A strain identified in ≥70% of influenza A-positive samples and the B lineage identified in ≥70% of influenza B-positive samples. A season was considered to have a B-strain mismatch if the B lineage in the vaccine was different from the dominant circulating lineage. A season was considered to have a partial mismatch when the two B lineages co-circulated in approximately equal proportions. All data were analyzed using Excel (Microsoft, Redmond, WA). Missing data were not replaced, and only descriptive statistics were calculated. During the 16 seasons from 2000–2001 to 2015–2016, 16,940 samples were collected and tested (Table 1). The fewest samples (315) were collected in 2003–2004 and, excluding the 2009–2010 A(H1N1) pandemic season, the most (2425) were collected in 2012–2013. During the 2009–2010 pandemic season, 3864 samples were collected. Of the 16,940 samples, 5144 (30.4%) tested positive for influenza. 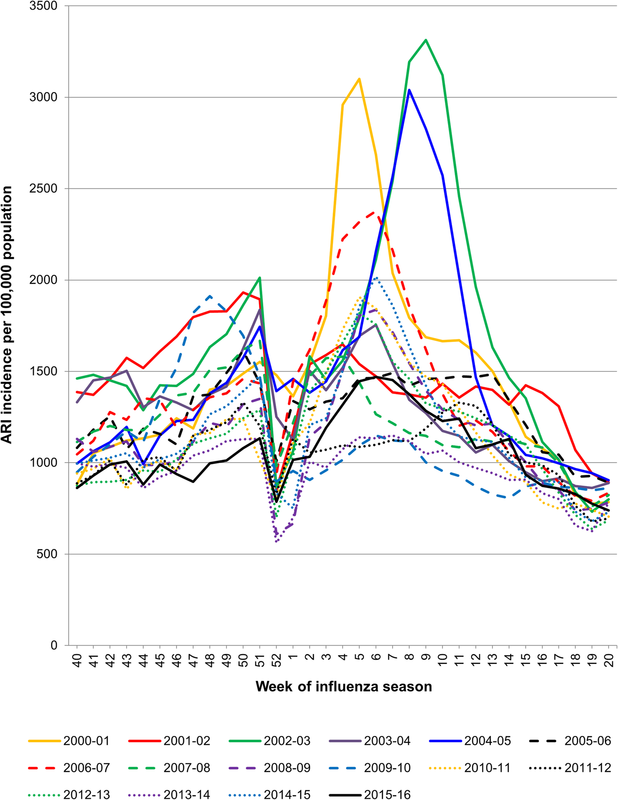 The proportion of influenza-positive cases was lowest (4.5%; n = 24) during the 2001–2002 season and, excluding the 2009–2010 pandemic season, was highest (48.6%; n = 1179) during the 2012–2013 season. During the pandemic season, 1275 samples (33.0%) tested positive for influenza. The earliest peak of ARI cases (week 48) occurred during the 2009–2010 pandemic season and the latest (week 11) during the 2011–2012 season (Fig. 1). Excluding the 2009–2010 pandemic season, ARI cases followed two main patterns: a continuous low or moderate number (seen in the 2001–2002, 2003–2004, 2005–2006, 2007–2008, 2011–2012, 2013–2014, and 2015–2016 seasons); or a concentration of cases over 10 to 15 weeks with a prominent peak (seen in the 2000–2001, 2002–2003, 2004–2005, 2006–2007, 2008–2009, 2010–2011, 2012–2013, and 2014–2015 seasons). For most of the seasons, ARI incidence decreased at week 52, coinciding with the Czech Republic’s winter vacations. Influenza A was responsible for 78.6% of confirmed influenza cases overall, and accounted for more than 55% of all influenza cases in every season, except for 2005–2006 when it was identified in just 6% (8/134) of influenza-positive samples (Table 1). Influenza B accounted for at least 20% of all influenza cases in 11 of the 16 seasons between 2000–2001 and 2015–2016, and represented 21.4% (1100/5144) of confirmed influenza cases overall. The highest proportion of samples positive for influenza B was during the 2005–2006 season (94%; 126/134), and the lowest during the subsequent 2006–2007 season (0%; 0/118) (Table 1 and Fig. 2). The proportion of influenza B was also very low during the 2003–2004 season (2.4%; 1/41) and the 2009–2010 pandemic season (0.1%; 1/1275). For seasons where data from sentinel and non-sentinel sources were tabulated separately (2009–2010 to 2015–2016), overall rates of influenza positivity were similar (Table 1). However, the proportion of influenza A was consistently lower for sentinel than non-sentinel samples, whereas the proportion of influenza B was lower for non-sentinel samples. For example, during the 2010–2011 season, influenza A accounted for 66% (140/211) of positive samples from sentinel sources but 88% (205/233) of those from non-sentinel sources; and influenza B accounted for 34% (71/211) of positive samples from sentinel sources but only 12% (28/233) from non-sentinel sources. The proportions of influenza A cases in different age groups were similar between the 2010–2011 and 2015–2016 seasons with most cases found in individuals aged 25 years or older (Table 2). In contrast, during the 2009–2010 pandemic season, more influenza A cases were seen in 15–24-year-olds (23.7% vs. 3.5–10.4% seen between 2010–2011 and 2015–2016) and fewer in adults older than 60 years (9.3% vs. 13.3–60.2%). Most influenza B cases were found in 6–14-year-olds in 2010–2011 (41.4%; 41/99) and 2011–2012 (36.5%; 19/52) but were more represented in the adult age groups from 2012–2013 to 2015–2016. The strain of influenza A (A/H1N1 or A/H3N2) was identified for 3246 (80.3%) of the 4044 influenza A cases (Table 3). Overall, 2168 cases (66.8%) were caused by A/H1N1, although more than one third of these (39.3%; n = 853) were from the 2009–2010 pandemic season. Both A strains were identified from the samples characterized in most seasons except for 2001–2002 and 2003–2004 where only A/H3N2 was identified, and 2007–2008 and 2009–2010 where only A/H1N1 was identified. Of the 15 seasons with significant A virus circulation (≥ 20% of influenza cases; see Table 1), A/H1N1 was the dominant circulating strain in six seasons and A/H3N2 in seven. In the remaining two seasons (2004–2005 and 2013–2014), the two A strains co-circulated in nearly equal proportions. The lineage was identified for 649 (59.0%) of the 1100 influenza B cases (Table 4). Of these, B Yamagata accounted for 341 cases (52.5%), B Victoria for 305 cases (47.0%), and both lineages for 3 cases (0.5%). Of the 16 seasons included in this study, both B lineages were detected in three, a single B lineage was detected in nine, and no influenza B was detected in four. Of the 11 seasons with significant B virus circulation, the dominant lineage was Yamagata in six and Victoria in four. In the remaining season (2015–2016), the two B lineages co-circulated in nearly equal proportions. The B strain in the trivalent influenza vaccine did not match the dominant circulating B strain in two of these 11 seasons (2005–2006 and 2007–2008). The 2015–2016 vaccine was considered to have had a partial mismatch with the circulating B lineages because influenza viruses of both lineages co-circulated. In this report, we describe the circulation of influenza viruses in the Czech Republic based on data collected from the national influenza surveillance network from 2000–2001 to 2015–2016. Although influenza A accounted for most influenza cases in almost all of the seasons, they typically co-circulated with influenza B viruses. Influenza B represented just over one-fifth (21.4%) of all confirmed influenza cases, although the proportion in each season ranged from as low as 0% (2006–2007) to as high as 94% (2005–2006). This is in line with European epidemiological data collected between 2001–2002 and 2010–2011, where influenza B represented 23% of influenza cases overall and from 1 to 60% of the cases each year . Influenza B frequency is known to vary widely between seasons in many countries worldwide . The results presented here are among the first describing the circulation of influenza strains in the Czech Republic. Some data for the Czech Republic were recently published by the Global Influenza Hospital Surveillance Network (GIHSN) for the 2014–2015 influenza season . Although the GIHSN collects data on only severe cases, it found that influenza B accounted for about one-third of influenza cases during 2014–2015. In most seasons with B strain circulation, a single lineage dominated, and generally these dominant lineages matched those reported during the same seasons in several other European countries [23, 26, 27]. In all but two of the 16 seasons (2005–2006 and 2007–2008), the dominant circulating B lineage was the same as the B lineage in the seasonal influenza vaccine. In one season (2015–2016), the two B lineages co-circulated in nearly equal proportions, resulting in a partial mismatch with the vaccine B lineage. Similarly, data from the US and Europe show that major mismatches occurred in 2005–2006, 2007–2008, and 2008–2009 [11, 26, 27]. Such mismatches between the B lineage in trivalent vaccines and the dominant circulating B lineage represent a missed opportunity to protect against influenza. Quadrivalent influenza vaccines containing both B lineages have been developed to avoid this [8–11] and are now included in WHO guidelines . These quadrivalent influenza vaccines are expected to further reduce the burden and economic impact of influenza beyond that provided by trivalent vaccines [29, 30]. Analysis of influenza cases by week revealed that some years had a clear peak of influenza cases but that others had a more even distribution and a weaker peak. How each influenza strain contributed to these patterns was not analyzed, although the circulation of influenza subtypes and lineages often changes over the course of a single season [25, 31, 32]. This complicates predicting which strains and B lineages will dominate each year and further emphasizes the need for quadrivalent vaccines. Interestingly, for seasons where data from sentinel and non-sentinel sources were tabulated separately (2009–2010 to 2015–2016), overall rates of influenza positivity were similar but the proportion of influenza A was consistently higher for non-sentinel than sentinel samples, with the reverse true for influenza B. As the non-sentinel samples were collected only from hospitalized individuals, this suggests that influenza A led to severe ARI more often than influenza B. This report provides essential information about the circulation of influenza viruses, but low numbers limited the analyses that could be performed. For example, we could not effectively stratify by risk category or influenza severity, although the oldest and youngest individuals, pregnant women, and individuals with chronic conditions are well known to be at increased risk for severe influenza [25, 31–33]. In addition, very few influenza cases were detected in some seasons, increasing the uncertainty around the circulation of individual A strains and B lineages. For most of the seasons, ARI incidence also decreased around the Czech winter vacation season, which is likely due to reduced movement and mixing of the population and perhaps also due to reduced ARI reporting, since many healthcare personnel also take vacation around this time. Regardless, the results highlight the variability of influenza strain circulation and confirm the substantial risk for mismatches between the B lineage in trivalent vaccines and the dominant circulating B lineage. Another potential limitation of the current analysis was heterogeneity in methods across seasons and between sentinel and non-sentinel sources. Case ascertainment by the surveillance system in the Czech Republic was based on the WHO definition of ARI for 2001–2003, but starting in 2004, it also included the European Centre for Disease Control and Prevention definition of ILI. Also, prior to 2009, influenza was confirmed by virological tests and typed/subtyped by antigen assays, but thereafter, influenza was confirmed and typed by reverse transcription-polymerase chain reaction. This did not appear to have influenced the overall positivity rate, although the frequency of influenza differed. However, this should not affect the conclusions about B lineage mismatches because a single B lineage strain was clearly dominant in most seasons. Surveillance data from the Czech Republic showed that influenza virus circulation varied considerably during the 16 seasons from 2000–2001 to 2015–2016. Influenza A/H1N1 or A/H3N2 strains accounted for most cases in almost all seasons, and were responsible for more than three-quarters of cases overall. Influenza B made a substantial, sometimes dominant, contribution, yet the B-strain lineage in seasonal trivalent vaccines did not always match the dominant circulating B-strain lineage. The results from this study should help further inform influenza vaccination policy in the Czech Republic. Medical writing support was provided by Drs. Phillip Leventhal and Jonathan Pitt (4Clinics, France). This study was supported by Sanofi Pasteur as the Global Influenza Hospital Surveillance Network (GIHSN) received support for this study from the Foundation for Influenza Epidemiology, which was partly funded by Sanofi Pasteur. Medical writing support was also paid for by Sanofi Pasteur. Named employees of Sanofi Pasteur participated in the study design and data analysis. This study was also supported by MH CZ - DRO (National Institute of Public Health – NIPH, IN 75010330). The Ministry of Health of the Czech Republic (MH CZ) partly supported the collection of sentinel clinical specimens but it was not involved in the design of the study, in collection, analysis and interpretation of data or in writing the manuscript. All authors participated in drafting the article or providing critical revision; approved the final version to be published; and agreed to be accountable for the accuracy and integrity of the article. In addition, MH, SD, AR, and JK contributed to the conception, design, analysis, and interpretation of the study; and HJ, RL, and AN participated in data acquisition. SD and AR are employees of Sanofi Pasteur. The remaining authors declare no competing interests. The National Institute of Public Health in Prague is partner of the Global Influenza Hospital Surveillance Network (GIHSN) and received support for this study from the Foundation for Influenza Epidemiology, partly funded by Sanofi Pasteur, and under the auspices of Fondation de France. JK is the national project coordinator of the GIHSN for the Czech Republic. Sanofi Pasteur also funded the medical writing support for the preparation and submission of the manuscript to the journal. Recommended procedure for vaccination against seasonal influenza in the Czech Republic [article in Czech]. Ministry of Health of the Czech Republic; 2011. http://www.mzcr.cz/dokumenty/doporuceny-postup-pro-ockovani-proti-sezonni-chripce_5194_1985_5.html. Accessed 23 Jan 2017. European Centre for Disease Prevention and Control. Seasonal influenza vaccination in Europe. Overview of vaccination recommendations and coverage rates in the EU Member States for the 2012–13 influenza season. ECDC; 2015. https://ecdc.europa.eu/sites/portal/files/media/en/publications/Publications/Seasonal-influenza-vaccination-Europe-2012-13.pdf. Accessed 28 Sept 2016. Prevention and control of influenza pandemics and annual epidemics. Resolution WHA56.19 of 28 May 2003. Geneva: World Health Organization; 2003. http://www.who.int/immunization/sage/1_WHA56_19_Prevention_and_control_of_influenza_pandemics.pdf. Accessed 9 Aug 2017. Seasonal influenza vaccination programme, country profile: Czech Republic, 2012–2013 Season. European Centre for Disease Control and Prevention, Stockholm, Sweden. https://ecdc.europa.eu/sites/portal/files/media/en/publications/Report%20Assets/seasonal-vaccination-coverage-in-europe-2012-13/Seasonal-Influenza-Vaccination-Programme-Country-Profile-Czech-Republic.pdf (2015). Accessed 16 Jun 2016. Czech Republic Population Worldometers. http://www.worldometers.info/world-population/czech-republic-population/ (2018). Accessed 7 Sep 2018. World Health Organization. Influenza surveillance country profile - Czech Republic. WHO. http://www.euro.who.int/__data/assets/pdf_file/0003/272505/Country_profile_influenza_Czech-Republic_final_ENG_new-layout.pdf?ua=1 (2015). Accessed 10 Aug 2017. World Health Organization. WHO Regional Office for Europe guidance for sentinel influenza surveillance in humans WHO Regional Office for Europe. http://www.euro.who.int/__data/assets/pdf_file/0020/90443/E92738.pdf (2011). Accessed 9 Aug 2017. World Health Organization Global Influenza Surveillance Network. Manual for the laboratory diagnosis and virological surveillance of influenza. WHO. http://apps.who.int/iris/bitstream/10665/44518/1/9789241548090_eng.pdf (2011). Accessed 15 Sep 2017.